The X-Wing fighters in some of amateur game developer Michael Real’s 14 Star Wars video games fly a little funny. The waddling AT-ST walkers occasionally leap up into the sky as if yanked by an invisible string. The TIE Fighters look like abstract art. Sometimes the stormtroopers march backwards. You haven’t heard of Michael Real and probably haven’t played his games. That’s fine. His creations could easily be missed amid an ocean of Star Wars creations. Even on Project Spark, the downloadable game development tool Real used to make his games, they swim among dozens of other Star Wars games. Most are short, clunky amateur attempts to recreate some of the magic of the best official games in the series. They’re far rougher than licensed, big-budget Star Wars games like the EA’s recent Star Wars Battlefront. On Project Spark, Real’s games have become minor hits, and in the past several months, he’s experienced the ups and downs of recognition and acclaim. The games are as rough as most amateur Star Wars creations, but they’re also oddly charming. The bulk of them comprise a six-game series called Empire Assault. I stumbled upon them a few weeks ago while looking through Project Spark for fan-made Star Wars games. I was initially amused by their awkwardness. As I played the rest of them, however, I began to value them differently. Each Empire Assault game is a little better, a little less broken and a little more functional and fun than the one before it. Real leaves notes at the end of each one, and they start to form an arc. As I played, I realized I was watching a creator’s emotions as he dealt with the encouragements and discouragements of sudden acclaim. 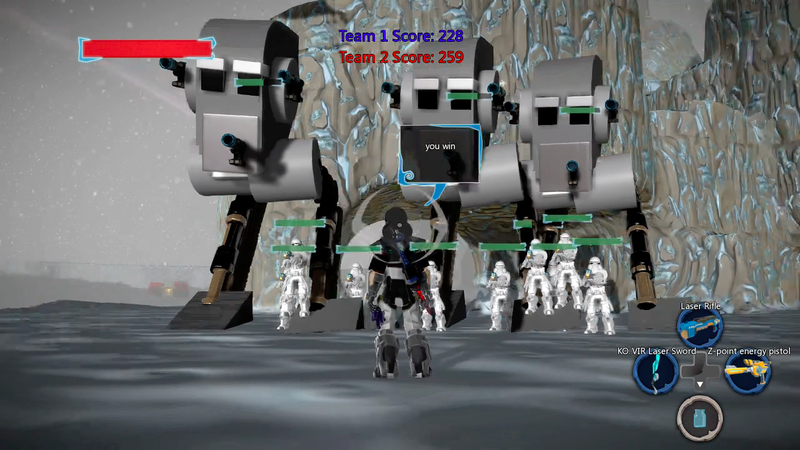 Empire Assault might be a microcosm of how all game development works. In 2014 he discovered Project Spark and downloaded it to his Xbox One. He started making short action games. He made a Halo one. He made a Godzilla one. He made a Star Wars shooting game that would serve as the first Empire Assault and got a decent response. You play as an imperial soldier and are supposed to be able to shoot the rebels, but the game chugs badly. Real spent a couple of days making each of his first games. He watched how-to YouTube videos from other Project Spark creators. He drew maps and placed spawn points. He tried to figure out why the enemies in his games acted strangely. Slowly, he began to figure things out. You can see his progress in Empire Assault 3, which doesn’t collapse into unplayability, even though it does include some troops who walk backwards. “EA 3 ran more smoothly, I think, because I started trying to figure out the problems with EA 2 and by testing the AI in a cheap little world I made,” he said. “I made the people spawn at different times...I also made the map bigger so they had more room, so they wouldn’t get stuck.” He also had an epiphany. If he lowered the amount of health that the enemy characters had, they would die faster and disappear. That would spare the game from having to process too many things. It made the game run better. As he made his games and heard from players, Real started thinking about how to please an audience. He felt compelled to add features to each new Empire Assault “so people would have a better experience with it.” As the games progressed he added a weapon selection button and a mini-map. People asked if they could play as the Rebels, and he eventually added that, too. By Empire Assault 5, he had created something that looked very vaguely like the snow-bound Hoth battles in the actual Battlefront games. Players race into battle, with TIE fighters and X-Wings battling overhead. AT-STs waddle through the snow, more or less in the correct direction. You can get in the vehicles and drive them. The fifth game is his favorite. His other games took a few days to complete, but he said that one took him more than a week. He was frustrated with the people copying his work and presenting it as their own. “They wouldn’t add anything to them,” he said. “And I saw no point in them doing it if it says [in the lineage tab] that I made the game.” He didn’t confront them, though. He felt like it wouldn’t accomplish anything. Empire Assault 6 is the most recent game in Real’s series. It’s the one with the option to play as a Rebel, an option added due to a fan request. The game runs even better than EA5 and shows that Real is improving. As with so many other hobbyist game designers, this will probably remain a side thing for Real, a way for him to have some fun making something for a few nights or weeks. A couple thousand people will play his games. A few of them will send messages to urge him to make more.